So, I am trying to get this healthy weight loss kick going. This morning, I grabbed a box of cereal we had in our pantry and brought it to work. I am determined to eat this for breakfast every day. The one I got is Honey Squares and taste wise, for being healthy, it's not that bad. I feel like I definitely taste the grainy part, but I ate it anyways. 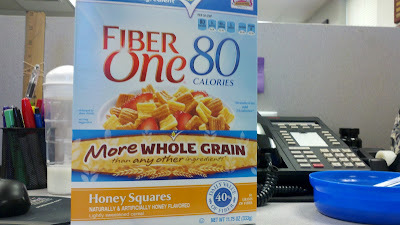 As I am eating, I am reading the box and it says it provides 40% of your daily value of fiber. Um, that's a lot of fiber no? Like, am I going to be pooping all day because of this? It also said that the fiber will make you feel satisfied without eating a lot. Boy is that true. If I had any other cereal, I would have still been eating. But I literally had the serving amount and it was enough. I don't know if it's because it filled me up or if the grainy taste got to be a bit much. But, I stopped eating way more than I need to so I am good. On another note, I got to see Magic Mike with my friends AGAIN last night. Totally worth the five bucks I paid for the ticket. It was as awesome as the first time. And my two friends cracked me up during the whole movie. The comments that were flying out of our mouths was just amazeballs. Seriously, you need to see this movie just to check out Channing Tatum dance moves. HOTNESS. He is a dam good stripper dancer. I can't even think straight right now because I am remembering the movie. I will leave you with this other picture. You're welcome.